Tom and I went to the ren faire yesterday and made lots of friends! Who doesn’t want to be friends with a fairy and a handsome pirate? My little wings! 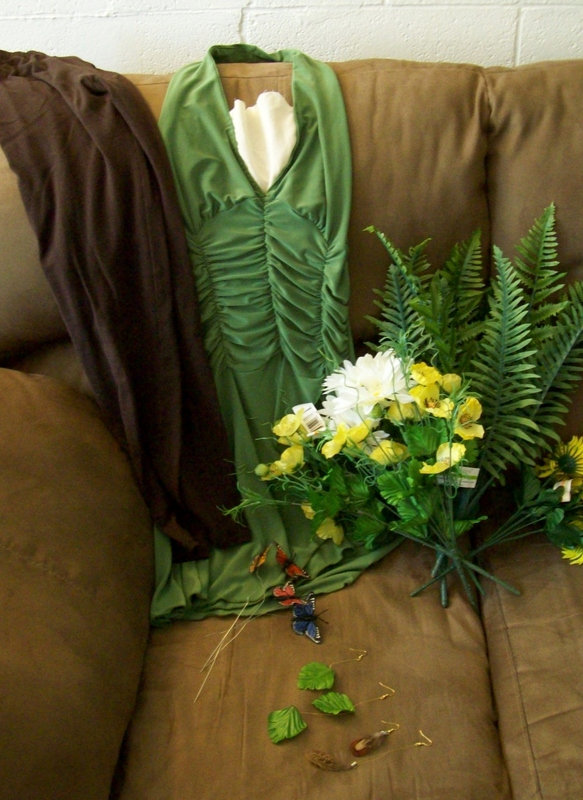 I took off some of the greenery, and replaced the elastic arm bands with wide brown satin ribbon. Much more comfy. Not to get too country on you, but is this what "buttin' a stump" means? Her wings and costume are magnificent! I tried cellophane on mine, but couldn't get it to work. I'll definitely have to try again. We ate renaissance pizza and baklava, and Tom drank all the rum. I bought a sweet mini-parasol with scalloped edges and a hand-painted cherry blossom design. If anyone knows a way to water proof rice paper, let me know! I also bought a walking stick made of cedar from a man named Cedar (I’m not kidding. He lives totally off the grid in Oregon.) You can see both of them in the picture with Twig. Tom's mandala design. I got a lotus design on my foot. 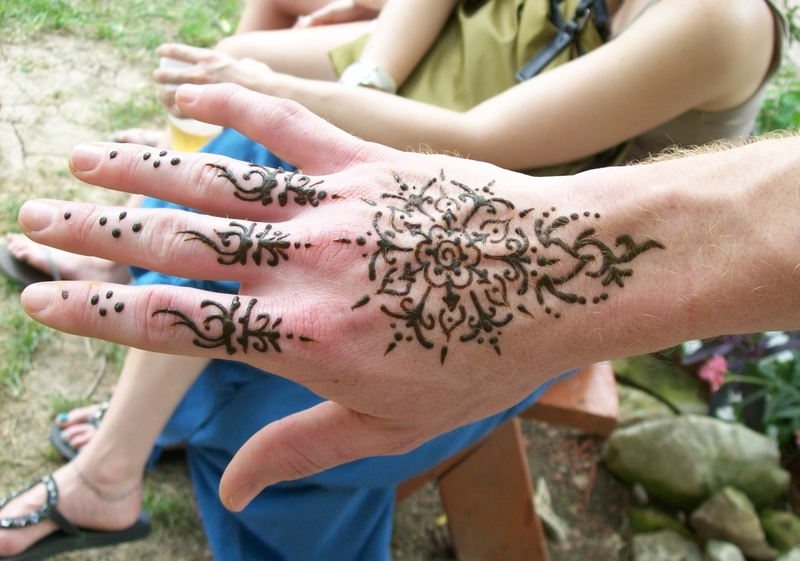 The designs have been Americanized, and henna is now an alternative to temporary tattoos, since the stain usually lasts one to three weeks. We walked our butts off and watched the joust, the royal court dance, and acts like bellydancing, whip crackers, pub singers, and joked with the roving faire characters. When we just couldn’t walk anymore (plus, the faire was closing) we took the long trek out to the car and made the long ride back home, where we soaked our feet and watched an episode of ye olde Bones. Okay, so, in case you didn’t know this about me, it’s Halloween in my head pretty much year round. 🙂 I love costume design and makeup (warning – I’m not an expert!) so I love the freedom of expression Halloween promotes. 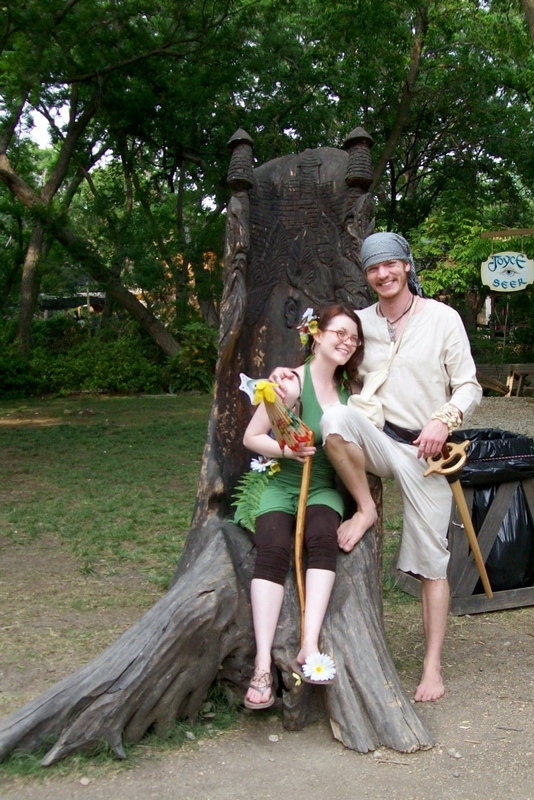 This week, Tom and I decided we’re going to Scarborough Faire, the renaissance festival in Waxahachie, again this year. We’ve been several times, but don’t get to go every year because of time and money constraints. We also decided to do something we haven’t done yet, and that’s dress the part! This is a pretty last-minute decision, so we’re working with what we have. 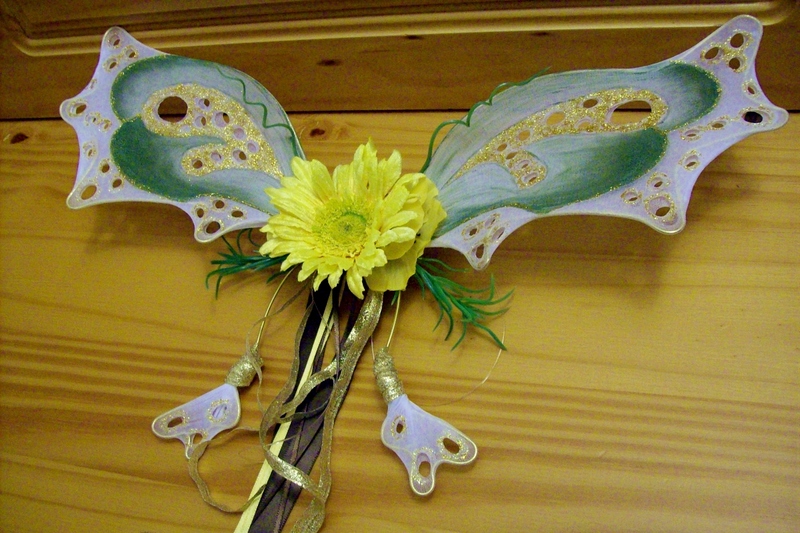 I’m going to be a faerie, and Tom’s going to go either Celtic or pirate, we haven’t decided yet. Now, I understand if you’re not into dressing up for renaissance festivals, or even Halloween, but it’s a great hobby to have if you’re looking for an something artsy to do in your free time, or if you’re looking for a project to keep your kids busy. 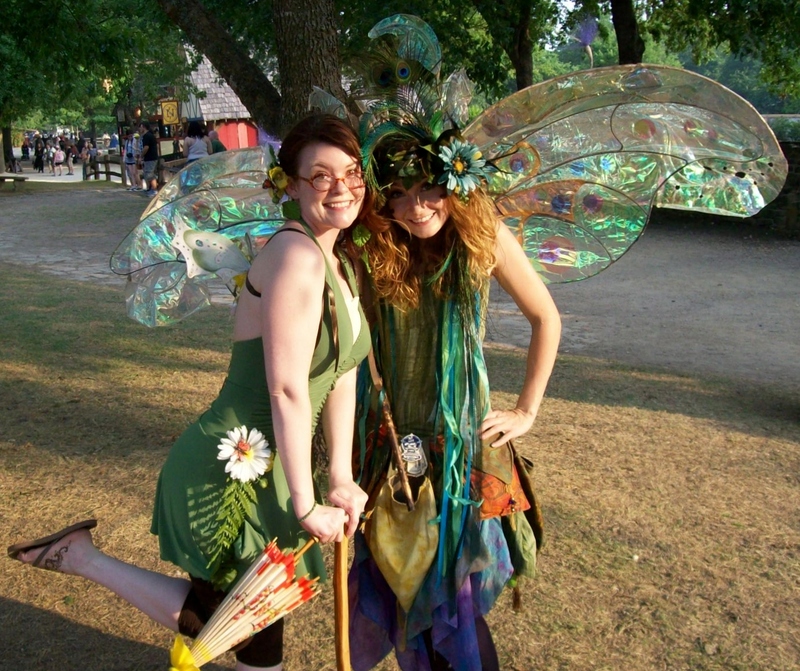 I’ve found some amazing tutorials on making wings, doing makeup, and costuming, so I just thought I’d share my faerie costume with you guys! I stole it from Tinkerbell's closet. She'll never notice - she's got a million of 'em! I lucked out and found this at a thrift store. 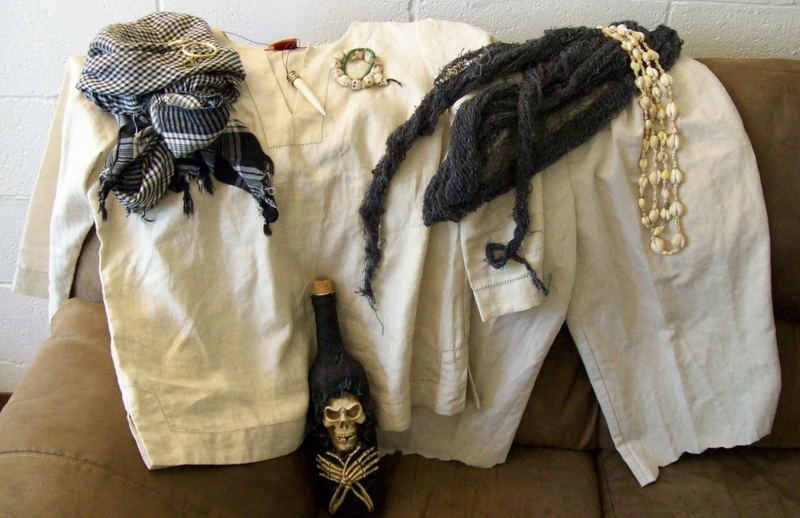 Of course, it was instantly in plans for a costume. I’ll probably add some fabric pieces cut from scarves around the waist and hem to create more dimension and give it a flowy, ethereal feel that’s indicative of the Renaissance period. Then, I’m going to find some large leaves (hopefully at the dollar store!) to create a waist cincher. I’ll also need smaller leaves and/or flowers for my hair, which I’ll wear in a messy updo – it’s going to be warm – and maybe some little forest friends, like bugs or butterflies. I think I’ll make mine smaller so that they don’t get in the way of all the fun to be had at the faire. I have plenty of gold and green makeup that I could use, but I haven’t decided how sparkly I want to be. Earthy or sparkly? Decisions, decisions. Anyway, that’s my inspiration for the costume! I’ll post pics of the finished product and do a real tutorial. As I was looking around for ideas for my Dorothy costume this Halloween, I realized just how ridiculously expensive ruby slippers were! Even the slip-around-your-shoe kind were around $15, and let’s face it, I’m not gonna pay $15 for something I’ll never use again. So, I trotted my way to Wal Mart, where I found silver flat shoes for 5 bucks. 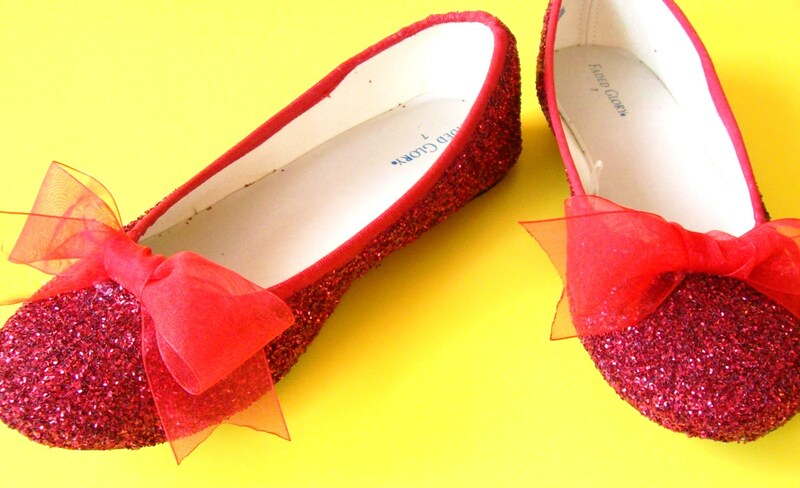 Now, you could really just stop there, since the shoes in L. Frank Baum’s original story were silver. (The moviemakers decided on ruby to take advantage of the newfangled Technicolor.) As I found out after asking whether I should keep the shoes silver or go ruby on Facebook, though, no one will have any idea why you’re wearing silver shoes and will think you’re crazy. So, my wonderful mom volunteered to glitter the shoes after I painted them so I could work on other parts of the project. 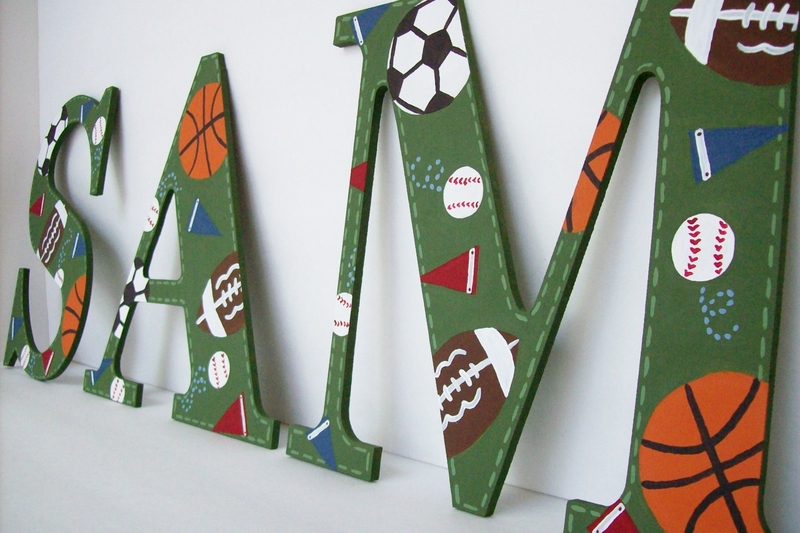 All I had to do was add the bows – love you, Mom! Find your shoes. I would choose flats, since there’s less area to cover (and they’re just more comfy.) I would also choose a lighter color, like silver or white, or red. If there are any areas around the edges of the shoes that are made from a softer, more absorbent fabric, you may want to take the time to paint them red with some fabric paint. The fabric could soak up the craft glue, causing you some trouble when trying to apply the glitter. Just take the fabric paint and apply it from the applicator, or brush it on. Let dry. P.S. – the shoes I bought had a draw string bow in the front. If yours have something similar, you can paint the bow red, or do like I did and untie the bow, knot the strings as close to the shoe as possible, and cut off the excess. Once you’ve done any painting you need to do, and it’s nice and dry, start applying the craft glue in small sections. After you’ve applied a little glue, shake glitter onto the area, and repeat all around each shoe. Let dry. (Be sure to do this on a surface like poster board or paper so that you can collect and save the leftover glitter.) Once dry, tap the shoes on your work surface, and see if they’re in need of another coat. If not, go to step 3. If so, just repeat step 2 again. You shouldn’t need to apply more than 2 coats to get the desired sparkly effect. The alternative, more time consuming version of step 2 is to apply red rhinestones individually to the shoes with craft or hot glue. Add bows. You can use cotton, satin, or organza ribbon, glitter or no glitter. Just tie 2 neat bows, and use hot glue to attach one to each shoe. Third, Halloween is coming up, and what better costume-in-a-pinch could you ask for? Hi everyone! I know I’ve been a little lacking in the blog world lately, but we’re busy working, planning a craft sale/Christmas festival, a big garage sale, and getting personal things taken care of. Mom is having her metiport taken out tomorrow, which should take some slightly hefty recovery time. She’ll need some help around the house during the recovery, but I’ll try my best to keep updating the blog! Anyway, for today’s Treasure Tuesday, here’s a cheerful, colorful Halloween collection by Giggles, who was kind enough to feature us! Speaking of Halloween, I just wrote a post on my other blog about green-ing your Halloween! Check it out for some scary and not-so-scary ideas on keeping your Halloween costumes, decorations, and treats earth friendly.